Was President Kennedy assassinated by a lone gunman or an organization? Were the CIA and FBI behind Martin Luther King Jr.’s assassination? Was Princess Diana’s death an accident or an assassination? What’s your gut feeling? Welcome back. A few years ago, I blogged about conspiracy theories (Conspiracy Theories; Conspiracy Theories, Continued). The studies I highlighted suggested that acceptance of conspiracy theories was tied to the need for control over one’s life and that the best predictor of belief in one conspiracy was belief in another. A study from Ohio State and Michigan universities adds to our understanding. These researchers examined how intuition and belief that facts are politically constructed relate to one’s willingness to embrace falsehoods and conspiracy theories. The researchers arrived at their findings in three stages. 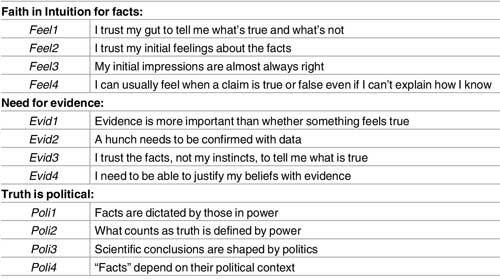 First Stage: First, they generated statements to be used as responses in surveys of Americans on the level of the respondents’ agreement with three concepts: (1) Faith in intuition for facts, (2) Need for evidence and (3) Truth is political. They began with 20 possible responses and reduced them to four for each concept through testing on 510 respondents and subsequent statistical analysis of relationships among the statements. 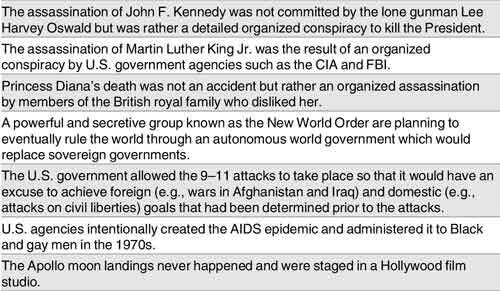 Second Stage: Next, they used the statements in a nationally representative survey of 630 respondents after obtaining the respondents’ beliefs about seven often repeated conspiracy theories, including those relating to Kennedy’s, King’s and Diana’s deaths. Third Stage: Finally, they used the 12 statements in three nationally representative surveys over the course of the 2016 election. For these three surveys, they repeatedly contacted the same respondents, 965 in the baseline, 764 in the second and 629 in the third. For this stage, they also queried the respondents on their belief about four prominent claims related to political and scientific issues: human activity affecting climate change; Muslim support for violence against Western countries; whether Iraq had weapons of mass destruction immediately before the Iraq war; and whether vaccines cause autism. The researchers employed graphical and statistical analyses (scatterplots, regression and structural equation modeling) to relate the responses to the acceptance of both the seven conspiracy theories and four prominent claims. They found that individuals who trust their intuition--who put more faith in their ability to use intuition to assess factual claims than in their reasoning skills--are uniquely likely to endorse conspiracy theories. In contrast, those who maintain that beliefs must be in accord with available evidence are less likely to accept conspiracy theories or other falsehoods, even on politically charged topics. Lastly, those who judge that facts are always shaped by politics and power are more prone to misperception than are those who believe that truth transcends social context. Let’s be clear here: Trusting one’s gut feelings is important if not critical in certain situations. Yet those who rely more on intuition and believe facts are politically biased than they rely on reason and evidence are more likely to accept conspiracy theories and misperceptions, including fake news. Whether the statement is credited to Einstein or The Container Store, it should be clear that intuition works best when underlain by facts. What are the chances that educators, science communicators, fact checkers and main-stream journalists can convince people to place more weight on reason and evidence? I wish I could be more hopeful, but changing citizens’ decision-making ability is difficult, especially when some very influential people boast of their reliance on gut feelings. Maybe this too shall pass. Thanks for stopping by.